Dave Van Horn is the President and CEO of PPR Note Co., a company that brings investors unique opportunities to create passive income through investing in real estate notes. He is an expert in the real estate business with over 30 years of experience as licensed Realtor, Real Estate Investor, and Fundraiser. 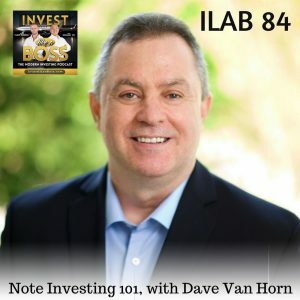 On this episode, Dave discusses the basic fundamentals of Note Investing including where and how to invest in it. He explains what a note is and how to profit from it. He shares his own venture from the real estate industry to the note business. You may not know what a note is; but after listening to this episode, you will understand how everyone is involved in this business. Listen to ILAB 84 on iTunes here or subscribe on your favorite podcast app. 01:02 – How he got into Note Investing? 16:25 – Where to acquire Notes? 25:34 – What to do with non-performing Notes? 27:51 – What to know when starting in Note Investing? 34:17 – How to invest in products on PPR?